Hindemith preferred to play the viola, but I understand he could play every orchestral instrument. He put his knowledge to good use when he decided to write a sonata with piano for every instrument in the orchestra. This provided the instruments with valuable repertoire and also demonstrated the composer’s ability to write easily and naturally for instruments which were seldom given a solo role. Although he had already written sonatas and other works for string instruments, he began this project in the 1930s, when he was already well established. He continued it through the years of exile, writing the final sonata, that for tuba in 1955. We have here the four for the main brass instruments, plus one other. Although the main interest is naturally in how Hindemith makes a coherent composition with an unusual combination of instrumentals, I should add that the piano parts are often far from simple, requiring a good deal of virtuosity. We begin with two pre-war works. The trumpet sonata begins with an angular but genuine melody on the trumpet, which through this movement leads, with the piano in an accompanying mode. The second movement is light-hearted and playful, the third a funereal piece, somewhat reminiscent of a passage in the Mathis der Maler symphony and opera. It has one of those acrid but consoling themes which were something of a Hindemith speciality. The horn sonata which comes from the same year gives the instruments more equal play. The first movement is a somewhat lumbering dance; the second is rather similar but lighter on its feet. The third is a helter-skelter chase for the piano with the horn joining in with declamatory outbursts. These are both good works, but I feel that the three later ones are finer. For one thing, they are about two thirds the length of their predecessors, and tend to be in four rather than three movements. This makes each individual movement a good deal shorter, which suits the instruments and the material well. The first of these here is played on the alto saxophone. Hindemith originally intended it for the alto horn, a band instrument confusingly known in Britain as the tenor horn. He then rescored it for the alto saxophone; the saxophone, although physically made of brass, actually counts as a woodwind instrument as it is played with a reed and not with a brass-type mouthpiece using lip vibration. It is the shortest work and my favourite of all these pieces, not for that reason but because it has the most memorable material. In the first movement a gentle rocking rhythm supports pastoral theme on the saxophone. The second movement is lively with a sepulchral middle section. The third is slow with a haunting theme. In the fourth, over a furiously busy piano part the saxophone has a largely declamatory line. The trombone sonata is perhaps as fine. The first movement features a complex interplay between trombone and piano. The second is serious, even mournful. The third is titled ‘Swashbuckler’s Song’ and features cheerful galumphing. The fourth is forthright, with a good deal of imitative writing. The tuba sonata followed some years later. 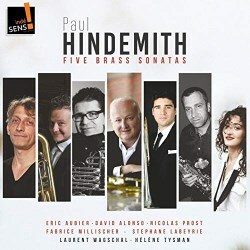 Hindemith shows his understanding of the character of the tuba, distinct from that of the trombone, by very different writing, often playful, while the piano has rapid figuration. The three movements are all quite light-hearted. The first is capricious, the second a short and nervous scherzo with a very fancy piano part. The third features a theme, first announced by the tuba, with a set of very varied variations. The players are all well established in their fields and they offer confident, sensitive performances. Particular praise should go to the pianists: Laurent Wagschal, who plays in most of the works, and Hélène Tysman, who plays in the horn sonata. The recordings, made in a range of venues in and around Paris, are well-matched and provide a suitable recital room ambience. There are notes in French and English – the latter rather stilted. There are other recordings of these works, some built round a particular instrument as well as some in various mixed combinations, but this makes a sensible and convenient programme. The complete series of Hindemith sonatas by MDG seems to have disappeared, so these are very welcome. May we now hope for a partner set with the woodwind sonatas?